If you’re responsible for human resources at a company, you want your team to be happy and motivated. You need to focus on those aspects of your company culture in order to increase employee productivity amongst the workforce. But productivity doesn’t come out of nowhere. It starts with employee engagement, which is a measure of how engaged and enthusiastic team members are about their work. A survey by Gallup found that companies that scored high in employee engagement outperformed those who did not by 10% on customer ratings, 22% in profitability, and 21% in productivity. It’s easy to shrug your shoulders and say “of course my team is engaged.” The truth is likely more complicated. Are your employees actually excited to come to work every day? Are your team members leaving for other opportunities? Today, we’re exploring employee productivity, and sharing what you need to know to motivate your team to success. Much of what we do at work is productive. But much of it isn’t. We check emails. We schedule meetings. We take breaks. And we are constantly on the hunt for relevant and useful company and industry news. In fact, McKinsey estimates that 28% of a worker’s time is spent each week writing emails and 20% is spent searching for information. This unproductive time translates directly into a loss of dollars. According to McKinsey, these tasks cost a company of 5,000 employees, paid the average U.S. salary, approximately $75 million a year. Productivity matters because it’s good for business, and impactful to a company’s bottom line. Researchers have found that levels of employee productivity directly correlate with employee retention, customer service, as well as overall revenue. But what other trends have they seen? What can be done to create more productivity employees? 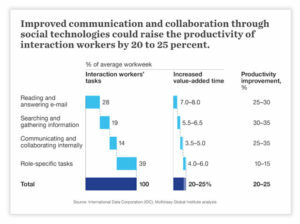 Connectivity – Productivity improves by 20-25% in organizations with connected employees, according to McKinsey. What does it mean to be connected? Employees need to be able to find the right information exactly when they need it, whether that’s through other employees, a company wiki, or another channel. Happiness – Being happy matters, as happy employees get more done. Researchers at the University of Warwick found that employee happiness led to a 12% spike in productivity. Unhappy workers were 10% less productive than their happy counterparts. Compassionate bosses – Having a compassion, empathetic, and understanding boss contributes to employee happiness and, in turn, employee productivity. One brain-imaging study showed that when employees remembered a time when a manager had been unkind, they showed increased activation in areas of the brain associated with negative emotion. Leaders that want to increase productivity in their company won’t get anywhere by asking their teams to work harder and smarter. Instead, leadership needs to develop a culture where employees enjoy coming to work. Additionally, you need to put processes into place that make it easy to get work done. As research shows, having a compassionate boss makes a huge difference in productivity. It’s not just individual managers, though. Companies also need executive leadership who understands that happy and healthy employees are also more motivated and productive. This leadership is much more likely to spend time and energy on developing the right company culture. When employees are recognized for their hard work and clever accomplishments, they feel a sense of purpose. Company cultures that have systems of recognition, whether through an online dashboard or through various rewards programs, have more motivated and productive employees. If you neglect to recognize when employees do a great job, they’re unlikely to push hard to do their best. Remember that you need to find ways to recognize the work, not just hand out gift cards occasionally. Because connectivity can increase employee happiness and productivity, teams can employ technology to help bring people together. For example, project management tools like Trello and JIRA, can bring teams together. Company wikis that are easily searchable can help, as well. And of course, employee productivity and engagement tools, such as our platform, can serve to foster connectivity amongst employees, as well. Your employees are not just worker bees for your company. They are full-fledged humans with hopes, dreams, and desires. After work, they go home to their family. They think about their own career growth. They wonder about the future. If you want to improve employee motivation, then you have to think holistically about the employee experience. Does your health insurance plan provide employees with the coverage they need? Are your employees working hours that will lead to burnout? These are things to think about as you sculpt a company culture that prioritizes employees.